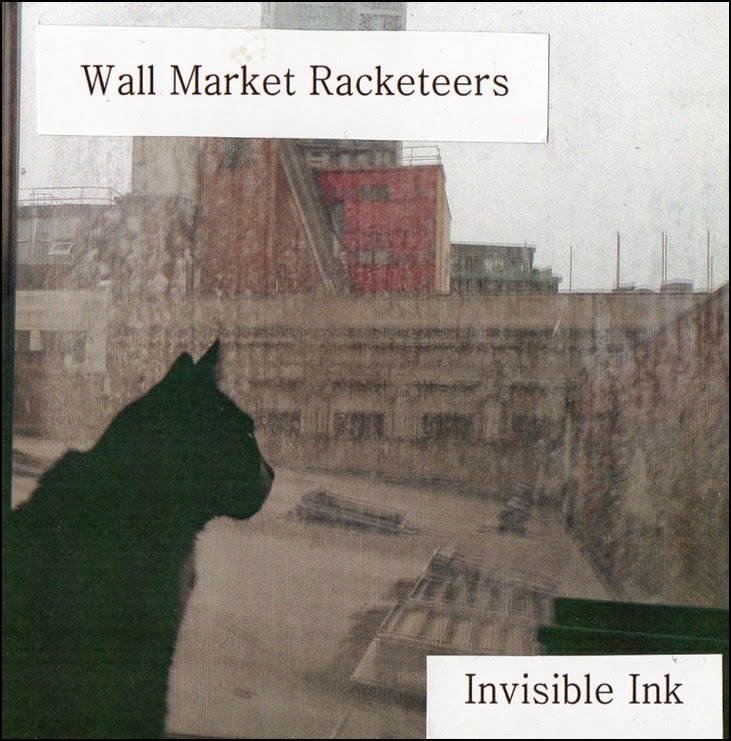 Wall Market Racketeers’ debut release is an EP entitled Invisible Ink. It manages a neat trick of being minimalist and yet intricately detailed at the same time. It's one of the most exciting new records we've heard this year. Opener One Way Trip To The Shoreline is a lament on human mortality, death being the one way trip – it starts with the ominous warning that “you can spend your life amassing envious wealth, you can waste your years prevailing your failing health” but the end result will be the same and it’ll happen too soon. There’s a glimmer of optimism in the hope that everything goes full cycle and there’s a reunion of “our atoms” out at sea. This is played out over a picked guitar strum that matches the mood of the song perfectly and it sets the scene for how the instrumentation of the record, whilst understated, performs its work across the seven tracks. Firesale starts with a spoken word piece about the Soviet-era newspapers Pravda (The Truth) and Izvestiya (The News) and the irony of no news in the former and no truth in the latter, but it’s subject matter is a damning indictment of modern culture and media, directed at Murdoch’s empire which is described as liars and self-perpetuating scum with tales of burning Muslims and riot photography, warning that a change is going to come. There’s criminally little written in modern music about politics and the press these days and most of it trades in empty catchphrases and it’s refreshing to hear such directness. Resist! starts off with murmured guitars which allow vocalist Alex to direct the song with his voice and judicious use of samples, until the chorus urges us to “resist, resist for every stolen moment, resist for every broken dream”. There’s talk of the underground and holding white tulips as a sign (we could be talking of forgiveness here or a cryptic reference to their symbolism relating to stock markets) and striking at the heart of an unspoken enemy. Petrichor (a phrase coined for the smell of rain after a dry period) is again extremely sparse in its arrangements accompanied by a sample of gentle falling rain and opening with the “to be is to be deceived so I heard”. For a five-minute song, it’s brave for it not to change direction at some point, but this just adds to the slightly disturbing impact the song has on the listener. Weltschmerz (literally translated from German as “world pain’) starts with the “fifty percent of nothing is still nothing” and talks of the ages of destitution and useless generations demanding retribution. There’s what might be a second Manic Street Preachers reference in there as it talks of Richie writing about this twenty years ago (Firesale name checks Kevin Carter) and we’re into the subject matter they addressed in those early records. Cognitive Dissonance (the mental stress of being confronted with information that contradicts long-held beliefs) mulls on ends justifying means and is a study of vocalist Alex’s feelings in this situation. Again, the instrumentation is very much in the background other than the closing thirty seconds which comprises a solo eerie piano. Indianna is a song of reflection to the female referred to in the title. As you’d expect by now, it’s not a series of empty platitudes, “My sweet Indianna, words will never be enough to express my appreciation for every ounce of love that you chose to share with me” over a beautifully simple piano with guitars coming to the fore deeper into the song as Alex delves further into the impact the subject has had on him . Invisible Ink feels like a record Radiohead would be making today if they’d stayed on more traditional songwriting paths. There’s clever use of sampling voices. It feels as if every note and word is there for a reason. It’s not easy accessible listening by any stretch of the imagination and in other less capable hands the concept could turn into an unmitigated disaster. However, it’s worth delving into and discovering because Wall Market Racketeers have gone into sonic areas and subject matter that bands avoid these days and have as a result produced one of the most intense, intelligent and pointed debuts of the year. We’ve seen them live and they’ve expanded to a five-piece with a drummer which gives them a more expansive sound. But that’s a story for another day. The EP is available to buy on Bandcamp and Wall Market Racketeers are on Twitter. Live video courtesy of Alistair Holdsworth via Wall Market Racketeers Twitter feed.